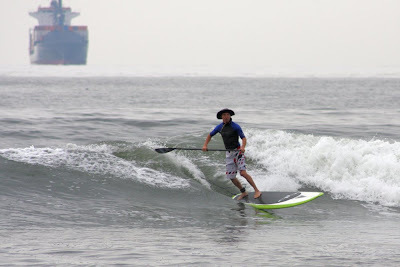 "Here are a few shots from one of those days when SUP turns a nuthin’ day into a blast. Here I'm surfing with friends John Gunnin and Greg Escalante... we just migrated from northside Seal Beach down to the river over a couple hours." Photo: John Gunnin, picking up what he can. "We picked up what we could and got surfed out on a day when most surfers were lamenting lack of swell and dirty water." Photo: Greg Escalante, driving off the bottom. I love that little extra squirt you get when you push off the back foot at just the right moment! Thanks Mitchell and Elva for the words and photos. Check back for more hot photos of Mitchell and friends! 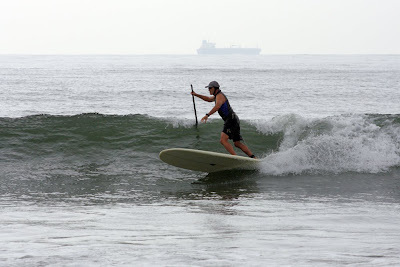 Ho, Ho, Ho- Stand up paddle surf lessons in San Diego. We're not afraid of some cold weather paddling! Sign up now for stand up paddle surf lessons in the New Year- we've got our list and we're checking it twice.... let's make sure you're on it! 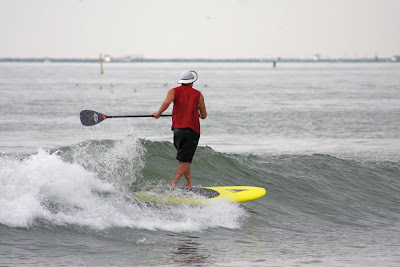 Come learn to stand up paddle surf with us! 619.213.6622 or john@paddlesurf.net Merry Christmas and Happy Holidays to all!